Field Crest Nursing Home came into existence primarily because a group of concerned, caring, forward looking individuals recognized the need for a local nursing home to serve the elderly of Hayfield, a town of approximately 1200 people, and the surrounding area. Extensive research resulted in the decision to proceed with plans to build a 61 bed city owned community on the northeast side of town. The citizens of Hayfield approved a bond issue at a special election in 1967. Field Crest Nursing Home was completed and opened on February 3,1969. All on one floor, the home consisted of two four-bed wards, two private rooms and the remaining all double rooms, and a nurse’s station. The dining room served as a “center place” for most activities, programs, church services, etc. Soon, the obvious need for additional beds resulted in the 23 bed addition in 1974. This provided the facility with a day room, bathing areas, utility rooms, and in the basement storage, a laundry area, staff lounge, and large activity, conference and therapy rooms. An Advisory Board consisting of representatives of eight area churches, served to guide Field Crest along with the City Council which was responsible for the nursing home’s operation. Samaritan Bethany, Inc. of Rochester was contracted from 1988 to August of 2000 to manage the facility after which the city and board again resumed full management. The nine member Board of Directors, which includes a rotating City Council member, helps to guide the home with final responsibility resting with the City Council to this day. The many changes in the level and diversity of care needed by residents, the increases in regulations, and the need for additional staff and services and replacing the two four-bed wards with either double or single rooms, resulted in a major building project in 1994-95. One of the two new additions consists of a new front entrance, office suite, and chapel or living room. The other addition off Wing 2 contained a social room, nurses’ station, four private rooms, and a secure unit of eight beds. Some renovations of the original building at that time included an assisted dining room and a special needs room. This project was funded by gross revenue bonds amounting to nearly two million dollars. The nursing home bed count remained at 84. Adjustments continued to be made with changes in demand for care. 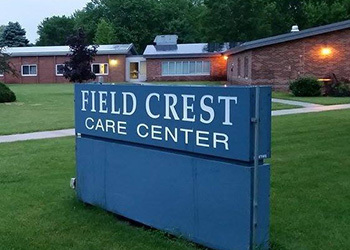 In 1997 a decision was made to change the name to Field Crest Care Center to better identify additional services. Plans also began for more senior housing resulting in the construction of Crest View Villa, a 20 unit independent living complex which opened on February 1, 2000. On April 1, 2000, Field Crest reduced its licensed beds from 84 to 74 and closed the secured unit at the end of Wing 2. Five years later, that unit re-opened with assisted living services for five apartments In response to needs in the independent units at Crest View Villa, assisted living services were made available there in May, 2006. Currently, Field Crest Care Center has a nursing home license for 51 beds, 9 assisted living units, and Crest View Villa has a housing with services registration for 20 units.